Last week at FITC Screens 13 I got to try Google Glass for the first time. Tom Emrich was there as part of the Xtreme Labs Lounge and I tried his device for about five minutes, long enough for him to show me how to use it and go through some basic commands. The screen was a little out of focus, but it wasn’t important to me that it be perfectly fitted and adjusted. I took a picture, swiped, tapped, looked at the New York Times’ app, and had it read it to me. I wrote that while sitting in Mike DiGiovanni’s Google Glass presentation, and watching him onstage I now understood the gestural language he was presenting: not that of someone with a neurological disorder, unable to focus on what’s in front of him, with eyes rolling upward, but someone who was experiencing a prosthetic hallucination in the right corner of his visual field. 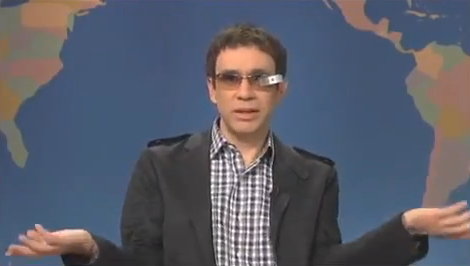 The thing about something like Ggl Glass is that you're not aware of what it looks like to others. In that way it's somewhat sociopathic. I used the word ‘sociopathic’ specifically: a social pathology, that is a social illness, where one behaves in a manner that is either offensive or unfriendly and unsociable. Human interaction requires at least two people, but Glass is not a device meant for two people. It’s an internalized, private experience. When you’re wearing one, you are meant to forget that it’s on, in the same way that traditional corrective eyeglasses become forgettable to the wearer. All the pictures we’ve seen are of other people wearing glass but of course this is because of how difficult it is to show the subjective experience, which is really what the product offers. 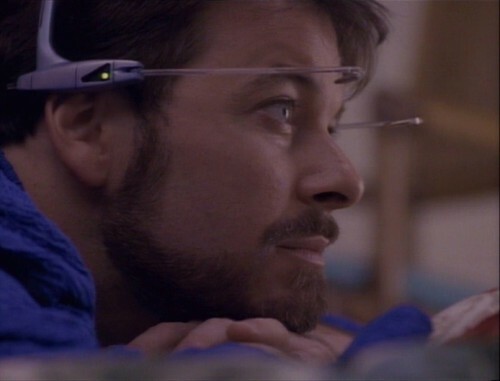 Google Glass is a beta product, and is the technological equivalent of 1990s cell phones with retractable antennas. In the 90s, owning a cell phone was a little offensive, because it signaled that you were either a busy-body big-shot or you were narcissistic enough to think that you were as important. (I remember telling someone in 1999 that I didn’t want a cell phone because I wouldn’t want to be bothered when I was away from home). However, the utility of a cell phone soon meant that by 2005, almost everyone had one. By 2007, the year Apple released the iPhone, the executives and managers of the world were already carrying Blackberries and other email-capable cellphones, and I was used to seeing these people staring at their little machines while in line for coffee. It occurred to me then that the Blackberry was the wand of the overclass, and I wondered what their jobs were that they had to be checking email while in line. (At the time I carried a basic Nokia). 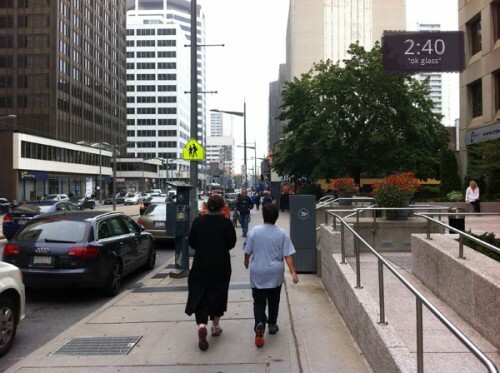 For this argument I’ll refer to this posture – or more specifically this behaviour, as “digital attention behaviour”. In 2007, in line at coffee shops, the future wasn’t yet evenly distributed, but now this digital attention behaviour has spread wide and become normalized. Part of the normalization is that looking at a rectangle displaying digital messages isn’t that much different than looking at a pad of paper. We were already used to seeing people read things silently, which in itself was a revolution centuries ago, when reading was usually done aloud. The rolling of eyes may eventually become a normalized digital attention behaviour, but right now, absent the even distribution allowing the rest of us to relate, it still looks strange and offensive. Unintentionally, Google Glass manifests the Western narcissistic ego, where private experience on public display happens without care for how it affects others. The selfishness of Glass is expressed when the Other cannot tell if a picture is being taken or if the time is being checked. With a smartphone, a glance can tell you if the person is emailing, texting, web browsing, or playing a video game. The information leaks, and this information is valuable in contextualizing our person-to-person interaction. Rendered completely private, this interferes with our Theory of Mind, our ability to imagine what others are doing and be able to relate to them. We can’t empathize without sufficient contextual clues. Inasmuch as Glass is a prosthetic for hallucination, it may also be a prosthetic for autism. I am nevertheless excited by the idea of Glass as both a prototype and an attempt to get us away from current digital attention behaviour, so that we can benefit from the data cloud while also being able to interact with one another as we did in the past. The irony that Glass is at present such a private experience that it interferes with human-to-human interaction, and is one of the bugs that needs to be resolved. “Wait, I’m hearing from Imris again.” Her face assumed the slack composure of aug trance, as if someone had just snipped all the nerves under her skin. In that world of implant-enabled augmented reality, an aug trance is something everyone can relate to, and fits into everyone’s Theory of Mind. It is not disturbing to see, and is an understood appearance. 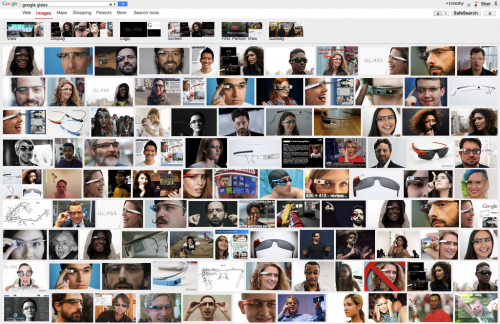 I suspect that a product like Glass will be successful. Again, its current design is reminiscent of the first cell phones. 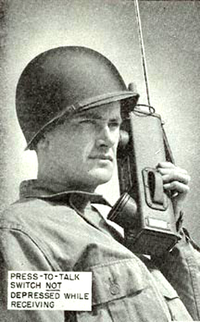 We know from the movies that portable radio-phones were available during World War II. Original 1960s Star Trek communicators were more skeuomorphic of the walkie-talkie than a phone, but when Motorola marketed the StarTAC phone in 1996 the reference to the fiction was obvious. Which exemplify that the idea of a heads-up-display is an old one, but Google decided to build it, tether it to an Android phone, and begin to market it. I don’t doubt something like it will eventually be successful. What is especially interesting is how such a simple idea and device turns out to have complicated social side effects, but these side-effects would never have become apparent if Google hadn’t taken the chance to implement this old idea to begin with.